Happy Monday Lovelies! I hope y'all had a wonderful weekend--especially you beautiful mommies out there! Here's to us having an amazing week! that pants are fab, love the top too! Oh wow, what a way to rock coloured pants! Looks Amazing! Great combo, I love it! I like the way you wear this necklace! I love the colour of your pants. The whole outfit just works perfectly together. The necklace is my favorite.. beautiful as always! Did you cut bangs? (Or just more layers?) Your hair looks amazing here!! Cute outfit too girl! The cut on these pants is perfect! Loving the relaxed fit and the cuffed hem paired with the heels. So chic! those bright orange trousers are just fantastic! I love this on you! I love your orange pants, they are so fun! This is such a bright and fun color combination! In LOVE with those trousers! Too cute! Thank you so much for the sweet comment over at The Jem Journal this past weekend! I am your newest follower! Have a great week! love these colors! the outfit is amazing. i found your blog from all things beautiful. I really don't think I've seen very many orange pants, but I LOVE these!!! You look totally darliing. I love your cute preppy outfit. The colors look amazing on you. Blue and orange is one of my favorite color combinations. Ohhh em geee!! LOVE this combo! You are so stylish chica! great outfit! love the orange on you! Very cute and chic look! Love it Giovanna! oh i love your fabulous gingham shirt darling! Cute! Love the gingham & orange together!! The blue and orange colors are great together... I'm wearing blue and orange today too! Fun color combo..especially loving those pants! Oooh, I love this combination! Really gorgeous. orange + blue are so great together!! You look amazing I love those pants! Love the colour of those pants! I've been really wanting to try orange! So LOVINGGGG your blog, I like your style. Hi Pretty Lady!! Love the bold color combo! And your hair looks super cute too!! You are so pretty and cute! Great color combination! I had never seen pants in such a color! Very unique! I just love this color combo - and I LOOOOVE your checkered shirt - you look amazing girl! The shirt is so cool, i love the pattern. And blue and orange justo goes so nicely! Love this outfit. Such a fun combo! Great outfit, that shirt is cool! Hi! thanks for dropping by my blog! Glad to have you! LOVE your space. very j.crew-esque! I like that you played this outfit up with the heels! 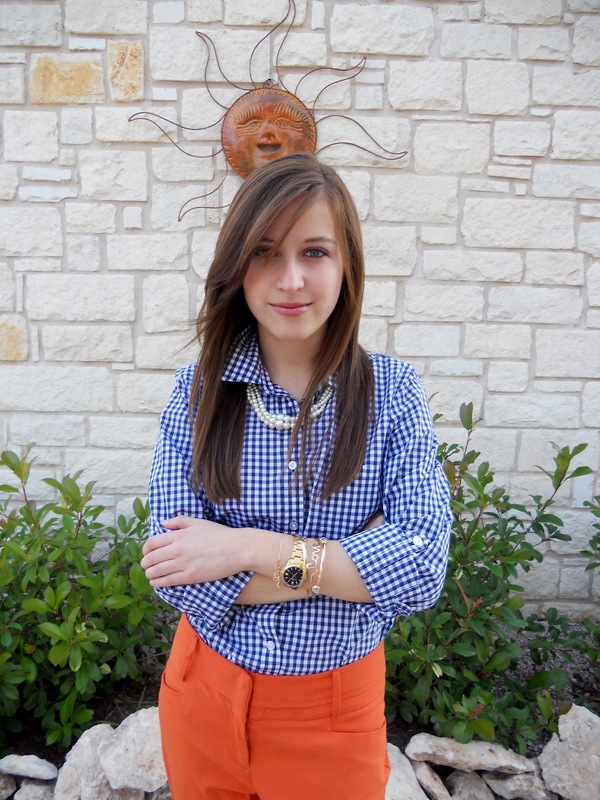 great checkered print..and love the royal blue and orange paired together! Those pants work great with the shirt, I wouldn't imagine it if you weren't wearing it :). I love it, great styling. Don't forget to follow because I will do a BIG give-away when I reached the 400 followers! I'm swooning over this look and now one of your newest followers! Love how you paired the colored trouser with a print, it's something i've been wanting try yet I still haven't been able to find the right fit trouser. Hope you're having a great weekend!